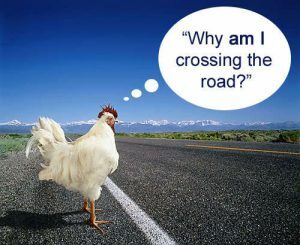 Pillar to Post: EXACTLY, WHY DID THE CHICKEN CROSS THE ROAD? When asked, “hey, Google, replied, “chicken motives may not be all that interesting.” Well, we beg to differ. Knowing why the chicken crossed the road is one of the eternal questions and deserves an answer. The online dictionary retorted with its usual cavalcade of memes, photos and illustrations. The two most likely answers according to Wiki editors are: a. to get to the other side. And, to show the possum that it is possible. Still unsatisfied we queried the Harvard University Department of Physics. A spokesman referred us to a universe of answers. Click here. Finally, we went to the “ultimate red state source” and read from “The Bible”, which did discuss the matter by saying “And God came down from the heavens, and He or She said unto the chicken, “Thou shalt cross the road.” And the chicken crossed the road, and there was much rejoicing.” Amen.